"I’d like to thank Heather for asking me to participate in sharing one of my favorite sewing tools! 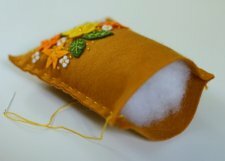 Something that I use all the time while sewing is a pincushion. Today I’m sharing with you how to make your own Flower Power Pincushion. 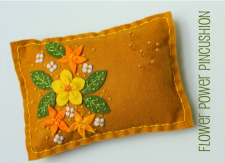 This one is designed after the vintage felt embroidery kits that I’ve enjoyed making over the years. You can hand cut all the pieces out of wool felt, but I also have some kits in my etsy shop that I’ve put together that include all the pre-cut wool felt shapes and supplies (including felt, needles, threads and beads) that you’ll need to make a pin cushion! Let’s get started!"